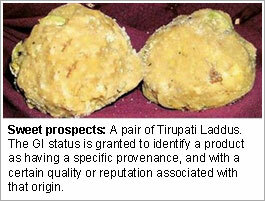 NEWS: Recently, the Venkateswara temple in Tirupati, Andhra Pradesh, scored a sweet legal victory: the Geographical Indications Registry upheld its claim of a GI registration over the famous Tirupati laddu. What does Tirupathi laddu and Feni in common? We are not talking about a mix of spirituality and the spirits. Along with the above mentioned items there are endless other items which have something in common. Some items for example say Darjeeling Tea (word & logo), Solapur Chaddar,Basmathi Rice, Mysore silk, Kancheepuram Silk, Mysore Sandalwood Oil, Malabar Pepper, Bastar Dhokra, Konark Stone carving, Bikaneri Bhujia, Nashik Grapes, Surat Zari Craft, Basmati rice, Alphanso Mango, Nagpur Orange, Kolhapuri Chappal, Agra Petha. Fine we know they are all from India. What we need to know is they are all part of items placed under ‘Geographical Indicators’ from India. 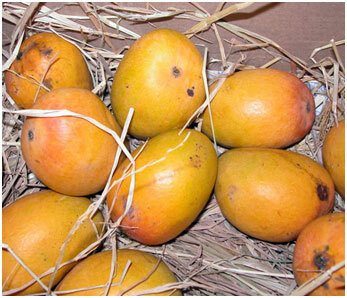 The list has more than hundred items which are placed under Geographical Indicators from India. The GI tag ensures that none other than those registered as authorised users (or at least those residing inside the geographic territory) are allowed to use the popular product name. Darjeeling tea became the first GI tagged product in India, in 2004-05, since then by September 2010, 184 had been added to the list. The WTO (earlier GATT) Agreement on Trade-Related Aspects of Intellectual Property Rights ("TRIPS") defines "geographical indications" as indications that identify a good as "originating in the territory of a Member, or a region or locality in that territory, where a given quality, reputation or other characteristic of the good is essentially attributable to its geographic origin." They are covered under Articles 22 to 24 of the Trade Related Aspects of Intellectual Property Rights (TRIPS) Agreement. Under Articles 1 (2) and 10 of the Paris Convention for the Protection of Industrial Property, geographical indications are covered as an element of IPRs. The term ‘geographical indication’ (GI) is introduced by the TRIPS Agreement (WTO).However, evidence suggest that the practice of using other closely related concepts existed even in the pre-industrial times. The concepts such as ‘appellations of origin’, ‘indications of source’ ‘designations of origin’ and ‘protected geographical indications’ used names of places and distinctive signs for variety of products as ‘indications of geographical origin’ (IGO). Examples of geographical indications from the United States include: "FLORIDA" for oranges; "IDAHO" for potatoes; "VIDALIA" for onions; and "WASHINGTON STATE" for apples. Geographical indications are valuable to producers for the same reason that trademarks are valuable. Geographical indications serve the same functions as trademarks, because like trademarks they are: source-identifiers; guarantees of quality; and valuable business interests. Geographical indications are place names (in some countries also words associated with a place) used to identify products that come from these places and have these characteristics (for example, “Champagne”, “Tequila” or “Roquefort”). A geographical indication (GI) can also be name or sign used on certain products which corresponds to a specific geographical location or origin (e.g. a town, region, or country). Since those qualities depend on the place of production, a specific "link" exists between the products and their original place of production. Suggest connection to region’s inherent characteristics (e.g., soil, climate, territory). It originates from a definite geographical territory. It is used to identify agricultural, natural or manufactured goods. The manufactured goods should be produced or processed or prepared in that territory. It confers legal protection to Geographical Indications for the specific country. It is to be noted that, Trade marks is a mark which distinguishes the goods and services of one trader from those of another. It gives its owner the right to exclude others from using the trade marks. On the other hand, a geographical indication indicates where the goods are produced and has characteristics that are attributable to the place of the geographical origin. In addition, the geographical indication goods may have different trademarks amongst the traders as long as the geographical indication goods produce by the registered proprietor of geographical indication. International trade made it important to try to harmonize the different approaches and standards that governments used to register GIs. The first attempts to do so were found in the Paris Convention on trademarks (1883), followed by a much more elaborate provision in the 1958 Lisbon Agreement on the Protection of Appellations of Origin and their Registration. When products with GIs acquire a reputation of international magnitude, some other products may try to pass themselves off as the authentic GI products. This kind of competition is often seen as unfair, as it may discourage traditional producers as well as mislead consumers. Thus the European Union has pursued efforts to improve the protection of GI internationally. The European Union has established distinct legislation to protect geographical names in the fields of wines, spirits, and agricultural products including beer. Article 22 of the TRIPS Agreement (WTO) says that all governments must provide legal opportunities in their own laws for the owner of a GI registered in that country to prevent the use of marks that mislead the public as to the geographical origin of the good. Thus according to the Article geographical indications have to be protected in order to avoid misleading the public and to prevent unfair competition. Article 23(to Wines and Spirits) of the TRIPS Agreement says that all governments must provide the owners of GI the right. This applies even where the public is not being misled, where there is no unfair competition and where the true origin of the good is indicated or the geographical indication is accompanied by expressions such as "kind", "type", "style", "imitation" or the like. In 1994, when negotiations on the WTO TRIPS were concluded, governments of all WTO member countries had agreed to set certain basic standards for the protection of GIs in all member countries. There are, in effect, two basic obligations on WTO member governments relating to GIs in the TRIPS agreement. Governments have been protecting trade names and trademarks used in relation to food products identified with a particular region since at least the end of the nineteenth century, using laws against false trade descriptions or passing off, which generally protect against suggestions that a product has a certain origin, quality or association when it does not. In such cases, the limitation on competitive freedoms which results from the grant of a monopoly of use over a geographical indication is justified by governments either by consumer protection benefits or by producer protection benefits. In many countries the protection afforded to geographical indications by law is similar to the protection afforded to trademarks, and in particular, certification marks. Geographical indications law restricts the use of the GIs for the purpose of identifying a particular type of product, unless the product and/or its constituent materials and/or its fabrication method originate from a particular area and/or meet certain standards. Geographical indications have other similarities with trademarks. For example, they must be registered in order to qualify for protection, and they must meet certain conditions in order to qualify for registration. One of the most important conditions that most governments have required before registering a name as a GI is that the name must not already be in widespread use as the generic name for a similar product. Of course, what is considered a very specific term for a well-known local specialty in one country may constitute a generic term or genericized trademark for that type of product. A registered geographical indication is protected for ten years from the date of filing and is renewable for every ten years as long as it is still in use. In some cases, geographical indications do not have to be protected or the protection can be limited. Countries employ a wide variety of legal means to protect geographical indications: ranging from specific geographical indications laws to trademark law, consumer protection law, and common law. The TRIPS Agreement and current TRIPS work in the WTO takes account of that diversity. At the international level, TRIPS sets out minimum standards of protection that WTO members are bound to comply with in their respective national legislations. However, as far as the scope of protection of GI under TRIPS is concerned, there is a problem of hierarchy. This is because, although TRIPS contains a single, identical definition for all GI, irrespective of product categories, it mandates a two-level system of protection: (i) the basic protection applicable to all GI in general (under Article 22), and (ii) additional protection applicable only to the GI denominating wines and spirits (under Article 23). 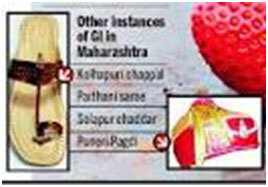 In this context it is to be noted that the Geographical indication's protection in a specific country is territorial. To seek protection in other countries, application must be filed with the respective countries. According to some economists and experts, this kind of protection is challenging, if Article 22 fails to provide sufficient intellectual property protection for the benefit of the genuine right-holders of a GI. A producer not belonging to the geographical region indicated by a GI may use the indication as long as the product’s true origin is indicated on the label, thereby “free-riding” on its reputation and goodwill. Consumers can take advantage of public goods without contributing sufficiently to their creation. This is called the free rider problem, or occasionally, the "easy rider problem" (because consumer's contributions will be small but non-zero). In December 1999, the Indian Parliament had passed the Geographical Indications of Goods (Registration and Protection) Act, 1999. This Act seeks to provide for the registration and better protection of geographical indications relating to goods in India. The Act would be administered by the Controller General of Patents, Designs and Trade Marks- who is the Registrar of Geographical Indications. Since the first Indian GI was registered in 2004, 172 GIs have been registered with the GI Registry of India. 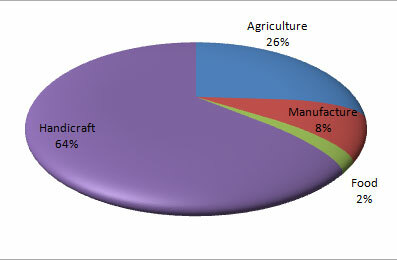 Of these, more than half (64 per cent) are handicrafts, more than one fourth (26 per cent) are agricultural products, and the remaining are food and manufacturing products. The trend of GI registration has been rising since last few years. 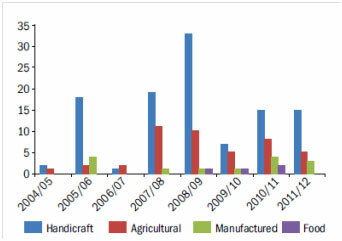 While handicrafts have been the most registered GIs consistently, agricultural and manufactured products are increasingly being protected under the GI Act over the past few years. According to experts, the recent increase in manufactured products being registered as GI can be partially attributed to more foreign products being registered at the Indian GI Registry. The state of Karnataka has been the forerunner in registration of GIs followed by the states of Andhra Pradesh, Kerala and Tamil Nadu. The spread of GI recognition is concentrated in the southern states. Products from other states are getting registered now. At the same time many states, which have several traditional varieties of agricultural products or handicrafts, are not forthcoming in applying for GIs. This case study relates to the geographical indication (GI) protection of Darjeeling tea. India is the world’s largest producer of tea. Darjeeling tea offers distinctive characteristics of quality and flavour, and also a global reputation for more than a century. Broadly speaking there are two factors which have contributed to such an exceptional and distinctive taste, namely geographical origin and processing. Thus Darjeeling tea has been cultivated, grown and produced in tea gardens in a well-known geographical area — the Darjeeling district in the Indian state of West Bengal — for over one and a half centuries. The tea gardens are located at elevations of over 2000 metres above sea level. India has put in place “a sui generis” system of protection for GI with enactment of a law exclusively dealing with protection of GIs. The legislations which deals with protection of GI’s in India are ‘The Geographical Indications of Goods (Registration & Protection) Act, 1999’ (GI Act), and the ‘Geographical Indications of Goods (Registration and Protection) Rules, 2002 (GI Rules). India enacted its GI legislations for the country to put in place national intellectual property laws in compliance with India’s obligations under TRIPS. Under the purview of the GI Act, which came into force, along with the GI Rules, with effect from 15 September 2003, the central government has established the Geographical Indications Registry with all-India jurisdiction, at Chennai, where right-holders can register their GI. That which is the only one of its kind -Unique. Sui generis is a Latin term meaning “a special kind”. In intellectual property rights discourse (IPRs) the term refers to a special form of protection regime outside the known framework. The WTO's Agreement on Trade-Related Aspects of Intellectual Property Rights (TRIPs) requires member states to provide protection for plant varieties either by patents or by an effective sui generis (stand alone) system, or a combination of the two. 25 per cent of the entire world’s supply of pepper. This pepper is unique for its sharp, hot and biting taste. Highly aromatic, with a distinctive fruity bouquet, it has the perfect combination of flavour and aroma. In order to protect the brand value of Malabar pepper, the Spices Board applied for a GI registration and after completing the formalities the registration was granted. 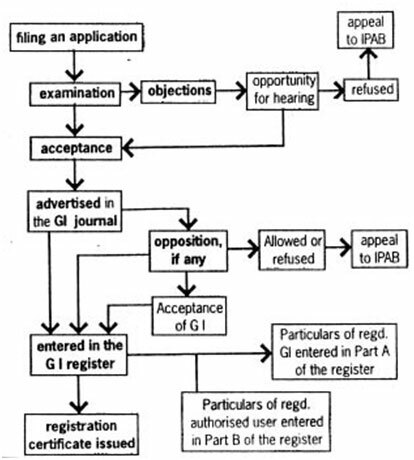 The definition of GI included in Section 1(3) (e) of the Indian GI Act60 clarifies that for the purposes of this clause, any name which is not the name of a country, region or locality of that country “shall” also be considered as a GI if it relates to a specific geographical area and is used upon or in relation to particular goods originating from that country, region or locality, as the case may be. This provision enables the providing protection to symbols other than geographical names, such as ‘Basmati’. As mentioned during the starting of this article there are many GI’s of Indian origin have already been registered with the GI Registry. These include GI like Darjeeling Tea (word & logo), Sholapur Chaddar,Basmathi Rice, Mysore silk, Kancheepuram Silk, Mysore Sandalwood Oil, Malabar Pepper,Bastar Dhokra, Konark Stone carving, Bikaneri Bhujia, Nasik Grapes, Surat Zari Craft, Alphanso Mango, Nagpur Orange, Kolhapuri Chappal, Agra Petha. Some other items include , Pochampalli, Ikat (textiles), Chanderi (sarees), Kashmir Pashmina (shawls), Kondapalli (toys), and Mysore (agarbattis),‘Muga Silk’ from Assam, ‘Madhubani paintings’ from Bihar, ‘Malabar pepper’ and ‘Alleppey Green Cardamom’ from Kerala, ‘Cora Cotton’ from Tamil Nadu, ‘Allahabad Surkha’ from Uttar Pradesh, ‘Nakshi Kantha’ from West Bengal, ‘Monsooned Malabar Coffees’ from Karnataka and Kerala. There is many more Indian GI in the pipeline for registration under the GI Act. Without adequate GI protection both in the domestic and international arena it would be difficult to prevent the misuse of Darjeeling Tea’s reputation, wherein tea produced elsewhere would also be sold under the Darjeeling brand, causing damage to consumers and denying the premium price to Darjeeling tea industry. The industry is now waking up to the fact that unless Darjeeling Tea is properly marketed and branded, the survival of the industry may be at stake and GI protection along with stringent enforcement can go a long way in helping the industry to improve its financial situation. 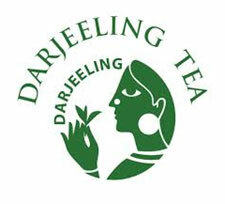 Thus, Tea Board has made strides in its quest for international recognition of Darjeeling tea as a trademark. Like all IPRs (Intellectual property rights), a GI is an intangible asset: an identifiable, non-monetary resource, not physical in nature, which constitutes a legal claim to future benefits through the special rights and privileges attached to it. Similarities with other IPRs, however, end here.GIs may not be sold, transferred, licensed, rented or exchanged, since they are either collectively owned (certification marks) or controlled by the State. Right-holders of other IPRs such as trademarks, copyrights or patents are not constrained by this limited control over their IP asset. The useful life of this asset is indefinite. IPRs provide excludable benefits by granting a monopoly over the exploitation of the particular IP asset. What is distinct for GIs is the fact that benefits are shared, and non-rival, or, at most, partially rival (because benefits to right-holders might decrease due to dilution of the GI).Once protected, the production of GI-labeled products is always geographically confined to the region, locality or terroir that provided the good with its special attributes. In most jurisdictions, this also implies that any producer established in the GI area that meets the product specifications may label his/her product with the GI, implying that a GI may be used by a number of different producers. This is specific to GIs among other IPRs.This geographical confinement implies capacity limitations in supply, often resulting in price premia, with an added impact on factors’ costs: the market value of land and local wages typically go up, with a positive effect on the terms of trade with other territories (even neighbouring regions). The price premium, coupled with production specifications, ensures both a strong homogeneity and a minimum level of quality among final products, limiting free-riding from “insiders” and ensuring non-rivalry in benefits to GI right-holders. Imperfect excludability and partial rivalry might occur, however, for a number of reasons. First, a brand associated to a particular GI might benefit from a higher consumer recognition or reputation, and exert a higher price premium, thus adding an element of competition to other GI producers. Second, free-riding by “insiders” (i.e. right-holders), through cuts in quality, may also entail dilution of the GI and partial rivalry of benefits. Third, as an IPR, a GI is protected from its unlawful utilization by non-right holders; free-riding from “outsiders” might be even more damaging to the goodwill of GI legitimate producers. As discussed earlier, Consumers can take advantage of public goods without contributing sufficiently to their creation. This is called the free rider problem, or occasionally, the "easy rider problem" (because consumer's contributions will be small but non-zero). A classic day today example of free rider and public good is defense and law enforcement (including the system of property rights), public works, lighthouses, clean air, inventions and so on. Consider national defense, a standard example of a pure public good. A purely rational person is an individual who is extremely individualistic, considering only those benefits and costs that directly affect him or her. Public goods give such a person incentive to be a free rider. Suppose this purely rational person thinks about exerting some extra effort to defend the nation. The benefits to the individual of this effort would be very low, since the benefits would be distributed among all of the millions of other people in the country. There is also a very high possibility that he or she could get injured or killed during the course of his or her military service. On the other hand, the free rider knows that he or she cannot be excluded from the benefits of national defense, regardless of whether he or she contributes to it. There is also no way that these benefits can be split up and distributed as individual parcels to people. The free rider would not voluntarily exert any extra effort, unless there is some inherent pleasure or material reward for doing so (for example, money paid by the government, as being a part of volunteer army).In the case of invention, an inventor of a new product may benefit all of society, but hardly anyone is willing to pay for the invention if they can benefit from it for free. The properties of geographical confinement of production, excludability of benefits and non-rivalry of benefits allow the GI to be characterized as “a localized club asset”, with a club membership consisting of the firms producing the GI good. The “club” aspect of the GI derives from the collective nature of the IPR. Cost-sharing, value-added-sharing and profit-sharing agreements are present all along the production, marketing and distribution chains of a GI product. Collective action among GI right-holders is required to coordinate activities, as well as to avoid free-riding on the reputation of the GI. According to some expertise excessively close coordination, however, has often led to uncompetitive behavior. In addition, GIs present a strong rural bias linked to a particular cultural heritage, leading some to argue that there is a public good dimension to their protection, as social benefits go beyond the profits of the firms involved in their production. The GI is therefore a “club asset” that has both a private and a public dimension to it. “Club goods” - They are are impure public goods characterized by partial excludability, no or partial rivalry of benefits and congestion phenomena. According to which a GI can be characterized as a voluntary, imperfectly excludable (due to free-riding from outsiders), shared, non-rival but congestible (due to potential dilution from within) club asset with a limited membership. Some experts define a club as a voluntary group deriving mutual benefit from sharing one or more of the following: production costs, the members’ characteristics, or a good characterized by excludable benefits. Besides excludability and rivalry, these authors stress four features of club goods. A primary distinction between club goods and pure public goods is that a club is voluntary (which is not the same as being excludable). Members choose to belong because they anticipate a benefit from membership, but they have a right (and ability) to exit. An individual can sell his/her share of an economic good, for instance, but cannot opt out from a public good such as national defence or traffic lights. Also, a club has an exclusion mechanism, achieved and maintained at some cost. For GIs, the exclusion mechanism is the legal protection of the GI. Huge information gaps (information asymmetry) exists in the markets today that lead to typical market information problems in the form of adverse selection and moral hazard. Information asymmetry impacts negatively on the market: the quality of total supply drops, higher-quality products are driven out of the market. In a situation like this, GI protection has the potential to eliminate information asymmetry and benefit both the producers and the consumers. Once the goods are registered as GI, they will be protected under the GI Law and any violation on this account would be tantamount to a legal offence. If the Act is implemented effectively, it will act as a deterrent to unethical producers selling their low quality and cheap products free riding on the reputation enjoyed by GI goods. It occurs when a party insulated from risk behaves differently than it would behave if it were fully exposed to the risk. Economists explain moral hazard as a special case of information asymmetry, a situation in which one party in a transaction has more information than another. In particular, moral hazard may occur if a party that is insulated from risk has more information about its actions and intentions than the party paying for the negative consequences of the risk. More broadly, moral hazard occurs when the party with more information about its actions or intentions has a tendency or incentive to behave inappropriately from the perspective of the party with less information. Information asymmetry models assume that at least one party to a transaction has relevant information whereas the other(s) do not. Some asymmetric information models can also be used in situations where at least one party can enforce, or effectively retaliate for breaches of, certain parts of an agreement whereas the other(s) cannot. In adverse selection models, the ignorant party lacks information while negotiating an agreed understanding of or contract to the transaction, whereas in moral hazard the ignorant party lacks information about performance of the agreed-upon transaction or lacks the ability to retaliate for a breach of the agreement. An example of adverse selection is when people who are high risk are more likely to buy insurance, because the insurance company cannot effectively discriminate against them, usually due to lack of information about the particular individual's risk but also sometimes by force of law or other constraints. An example of moral hazard is when people are more likely to behave recklessly after becoming insured, either because the insurer cannot observe this behavior or cannot effectively retaliate against it, for example by failing to renew the insurance. The Agreement on Trade-Related Aspects of Intellectual Property Rights (TRIPS) is an international agreement administered by the World Trade Organization (WTO) that sets down minimum standards for many forms of intellectual property (IP) regulation as applied to nationals of other WTO Members. It was negotiated at the end of the Uruguay Round of the General Agreement on Tariffs and Trade (GATT) in 1994. Specifically, TRIPS requires WTO members to provide copyright rights, covering content producers including performers, producers of sound recordings and broadcasting organizations; geographical indications, including appellations of origin; industrial designs; integrated circuit layout-designs; patents; new plant varieties; trademarks; trade dress; and undisclosed or confidential information. TRIPS also specifies enforcement procedures, remedies, and dispute resolution procedures. Protection and enforcement of all intellectual property rights shall meet the objectives to contribute to the promotion of technological innovation and to the transfer and dissemination of technology, to the mutual advantage of producers and users of technological knowledge and in a manner conducive to social and economic welfare, and to a balance of rights and obligations. Although many of the legal principles governing intellectual property rights have evolved over centuries, it was not until the 19th century that the term intellectual property began to be used, and not until the late 20th century that it became commonplace in the majority of the world. The British Statute of Anne (1710) and the Statute of Monopolies (1624) are now seen as the origins of copyright and patent law respectively. Trademarks are used to claim exclusive properties of products or services. The usage of trademarks by its owner can cause legal issues if this usage makes them guilty of false advertising or if the trademark is offensive. The unauthorized usage of trademarks by producing and trading counterfeit consumer goods is known as brand piracy. The owner of a trademark may pursue legal action against trademark infringement. World Intellectual Property Organization (WIPO) is the global forum for intellectual property services, policy, information and cooperation. The WIPO is one of the specialized agencies of the United Nations. WIPO was created in 1967 "to encourage creative activity, to promote the protection of intellectual property throughout the world. "WIPO currently has 187 member states, administers 26 international treaties and is headquartered in Geneva, Switzerland. The Indian Patent Office is administered by the Office of the Controller General of Patents, Designs & Trade Marks (CGPDTM). This is a subordinate office of the Indian government and administers the Indian law of Patents, Designs and Trade Marks. The patent office is headquartered at Kolkata with branches in Chennai, New Delhi and Mumbai, but the office of the CGPDTM is in Mumbai. The office of the Patent Information System and The Rajiv Gandhi National Institute for Intellectual Property Management is at Nagpur. The Geographical Indications Registry (GIR) is situated at Chennai. Its main function is registration of Geographical Indications (GIs) under the Geographical Indications (Registration and Protection) Act, 1999. A Geographical Indications Registry with all India jurisdiction operates in Chennai, as per the Geographical Indication of Goods (Registration and Protection) Act 1999. Under the Act, agricultural, natural or manufactured goods originating or manufactured in the territory of a country, or a region or locality in that territory, where a given quality, reputation or other characteristic of such goods is essentially attributable to its geographical origin and in cases where such goods are manufactured goods, one of the activities of either production or of processing or preparation of the goods concerned takes place in such territory, region or locality, are registrable as Geographical Indications. Whether a particular product is registrable or not is determined by the Registrar of Geographical Indications, on receipt of the application. Geographical Indications registration gives to the registered proprietor and its authorised users, the legal right to the exclusive use of the GI and also the right to obtain relief in case of its infringement. Exclusion of unauthorized persons from misusing GI would ensure that genuine products of the rightful producers are marketed. NIPO is an association of creators, users and owners of Intellectual Property. Members of NIPO include scientists, authors, artists, filmmakers, musicians, corporates, civil servants, academicians, legal experts and intellectuals among others. Catalyzes awareness about the rights of intellectual property (IP) owners and regulates through by-laws or otherwise the professional practice, etiquette, conduct and discipline of the Members, arranges social activities for Members of the Organization and promotes knowledge of intellectual and industrial property law by lectures, discussions, books, correspondences, pamphlets, dissemination of information or otherwise and many more activities.